I finally received my journaling bible today! 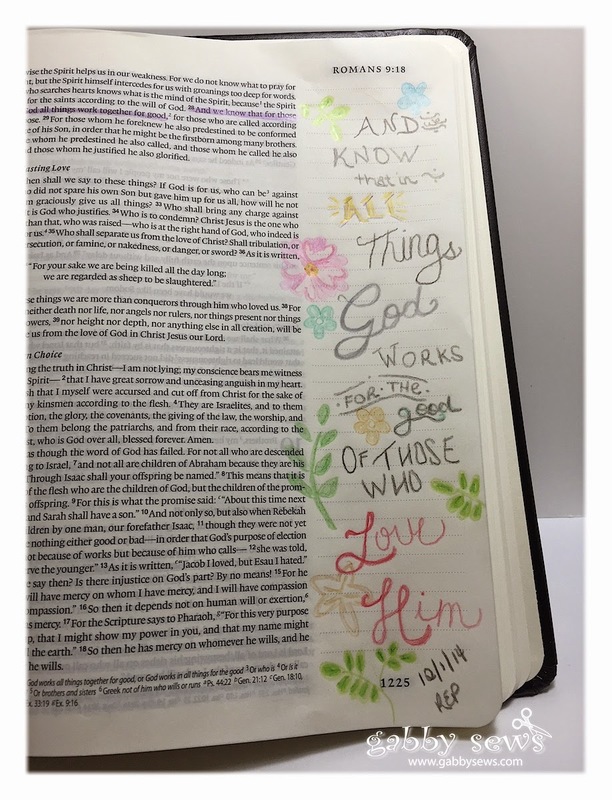 My husband encouraged me to jump right in and I chose to art journal my favorite verse. This verse has meant so much to me over the years. It's the sort of verse that even when I am having an absolutely horrible day/week/month I can hang on to that promise. I knew I wanted some fun hand lettering and also wanted to add some flowers to my page. When I look at nature I am struck with how God can take something as homely as a seed and turn it into a beautiful flower. Sometimes I feel like he does that with my life too. There have been so many things that while I was going through them felt like they would never turn around but things always seem to turn out. His promises are always true!! I'm not very good at hand lettering so I found some lettering online (unfortunately I couldn't figure out who actually created it) that I liked and then I traced the lettering on a scratch paper to fit the space I have in my bible and then slipped that paper under the bible page and traced everything with my colored pencils. I debated stamping some flowers on the page but I was afraid the ink would bleed through the paper. So I grabbed the Close to My Heart #S1411 - It's the Little Things (November Stamp of the Month) and using the acetate sheet only I traced the flowers and leaves using colored pencils. To tell the truth I was a little afraid to even get started with this project but once I got going I had a great time and found myself completely immersed in what I was doing. ***My bible is the Crossway ESV Single Column Journaling Bible. I purchased mine directly from Crossway through their website. I had originally ordered it on Amazon but it was backordered for several weeks so I finally cancelled my order. That is the first time I can remember Amazon failing me!